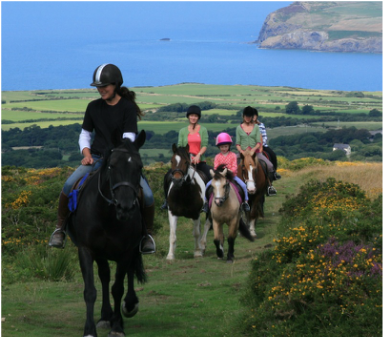 Horseriding in Pembrokeshire only needs to be tried once then you’ll be hooked. 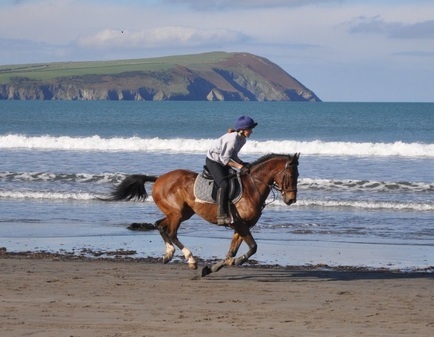 Pembrokeshire offers a diverse landscape for horse rides and horseriding holidays, from beach rides, to a network of rural lanes for hacking, and the Preseli Mountains for more challenging terrain. We are lucky enough to have two fantastic stables close to Newport which offer lessons and trekking. Are you looking for something different to do this summer? Why not try horse riding with Havard stables? They offer long and short treks, cream tea rides to Penlan Uchaf Gardens as well as pub rides to the famous pub the Dyffryn Arms or “Bessies” as it is known, in the heart of the Gwaun Valley. Havard stables can also offer half hour treks for those who would just like a short experience on a horse, you can be lead if required which is a relaxing way to see the wonderful views of Newport Mountain. They also offer an hours ride, an average trek for beginners or an hour and a half for those that can trot and possibly canter. Crosswell Riding Stables is a Licensed Riding and Trekking Centre which has been established for over 25 years. Nestling in the shadow of the Preseli hills in the heart of the undiscovered Pembrokeshire National Park you will find Crosswell Riding Stables, where the atmosphere is relaxed and informal and the views and scenery are stunning. All abilities and ages catered for with all types of horses and ponies available. All lessons undertaken in enclosed sand school, by qualified Instructor in either 30 minute or 1 hour sessions. From 1/2 hour to a full day’s ride. A variety of routes which take in the Preseli hills, ancient bridleways and woodlands can be explored. What better way to see the beautiful mountainside or the Tycanol woodland.